This is a fairly simple subject. Yet, at the same time, complex. Bacon. I would be happy eating bacon with every meal. In fact, if it weren’t for my love of the other available meats out there, I would! 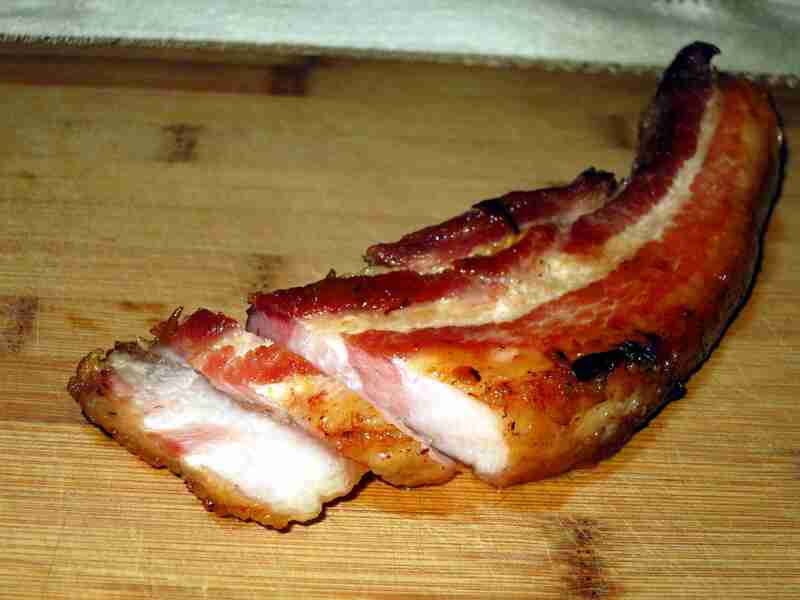 So this page is dedicated to bacon. Here I will share my critiques of the bacon I can find (at least, those worth trying) in the grocery stores. I will post the occasional recipe, centered around bacon as an ingredient. And I will share thoughts, ideas, and bacon type projects that I am involved in. Because bacon is worth the effort. But first, what do the experts have to say on the matter? This is quite possibly the most comprehensive article I’ve ever seen discussing the different pork production “Marketing Words” that are currently being used in the industry, and what they actually mean. I was floored by some of what I read in here. Sadly, other things were entirely unsurprising. And for added benefit, the author takes the time to recommend places (and not just his own farm) that readers should go look for their pork products. I highly recommend this article! What you should know about Pork Production claims. And here are my own thoughts on the matter: What’s In Your Bacon? And for all other things bacon, keep an eye on this page. I will keep you updated and informed! These are mostly self-explanatory. After the list, though, there is a little additional note on artificial nitrates and nitrites which is worth reading. Obviously, Nitrates and Nitrites are perfectly fine, harmless, natural occurring compounds in many of our foods. In fact, celery is one of my favorite foods, and it’s loaded with them. However, recent information regarding artificial nitrates and nitrites indicates that they are overloaded in the extreme with a disturbing amount of bad things in them: arsenic and heavy metals. So I’ll stick with the natural nitrates and nitrites, thank you. Interestingly, the extra little condition on my number one rule is often an added “fine text” on the packages. As I stated above: natural nitrates and nitrites are fine; they don’t come with the additional poisons which give these compounds such a bad name. The Bacon Project! love it! But now that I am doing this, I am having ideas for other things I can do too. I’m definitely having fun with it! I’m not sure where I will take this ultimately, but I am definitely looking forward to the journey! LOVE Bacon – Love the project. Thanks! I’ve really enjoyed putting it together! And it has been pretty popular, which is really encouraging! Awesome! I love doing the “research” to make it possible! Thanks Rakhi! I am so glad I could help you find some cleaner, better bacon! That’s what this Bacon Project is all about!! I was the same way; as I learned more about the dangers of commercial nitrates/ites, I cut bacon out entirely as well. Then one day I discovered some of the bacon in The Bacon Project; added it back in, and realized how much I had missed it! I must remember you’re here, Seeing your comments at 365 reminded me to check in here. And I’ll be FBing you as well. I SO miss 365! I was on there every single day which she was posting regularly – it’s a bummer not to be seeing her regularly! Really. She still checks in and answers comments, but I miss her posts. Yup – I drop her a line from time to time. We still keep contact.